The White House has set new criteria for visa applicants from six mainly Muslim countries and all refugees, requiring them to have a "close" family or business tie to the US. The rules, affecting people from Iran, Libya, Syria, Somalia, Sudan and Yemen, are coming into force on Thursday. They were issued after the Supreme Court partially restored President Donald Trump's travel ban on Monday. The executive order had been blocked by lower courts since February. The revised rules - taking conditions laid out in the Supreme Court ruling - come into effect at 20:00 Washington time (00:00 GMT). According to the new rules, confirmed to the BBC, for the next 90 days those from the six countries without a close relationship will not be able to enter the US. Those considered to have a close relationship under the policy include a parent, spouse, child, son or daughter-in-law, or sibling, including step- or half-siblings. Excluded are grandparents, aunts, uncles, nieces, nephews, in-laws, extended family and grandchildren. Trump travel ban: What happens next? Also exempt from the new rules are those with business or educational ties to the US. However, the guidelines specifically state that the relationship must be formal, documented and not formed for the purpose of evading the order. Those who already hold valid visas are not affected. Dual nationals who travel on their passport from the unaffected country will also be allowed entry. Why did a US veteran give his medal to a stranger? Is Trump's bleak vision of America justified? What exactly does the Supreme Court ruling say? The Supreme Court said in Monday's decision that it would make a final ruling on the executive order in October. But in the meantime, it added, the order "may not be enforced against foreign nationals who have a credible claim of a bona fide relationship with a person or entity in the United States". The court also approved the 120-day ban on refugees entering the United States, allowing the government to bar entry to refugee claimants who do not have any "bona fide relationship" with an American individual or entity. President Trump called the court's decision a "victory for our national security. He said the order was needed to stop terrorists entering the US, but critics said it was a ban on Muslims. Lawyers on both sides of the argument have warned that the new restrictions could open the door to a flood of legal challenges. In particular, the exact meaning of the phrase "bona fide" was expected to come under scrutiny. Meanwhile, a number of activist groups have promised to help people caught up in the ban. 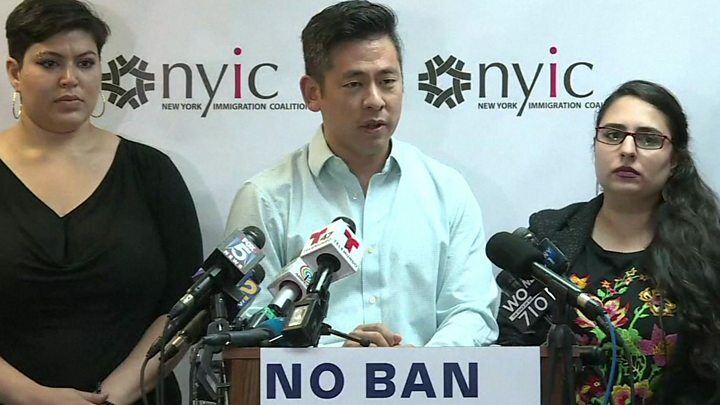 The New York Immigration Coalition says it plans to be at the city's John F Kennedy International Airport to "monitor the effects of Trump's revised Muslim and refugee ban". But so far, the order does not appear to have had too big an impact on travellers. A spokesman form Emirates, the Middle East's largest airline, said on Thursday: "Our flights to the US are operating as per normal. All passengers must possess the appropriate travel documents, including a valid US entry visa, in order to travel." Trump travel ban: What does this ruling mean?